The Māori prophet and military leader Te Kooti and his men killed a number of volunteer cavalry at Ōpepe, on the Napier–Taupō road, in 1869. Soon afterwards a chain of fortified police posts, linked by telegraph, was built by the Crown between Napier and Lake Taupō, including Ōpepe itself. 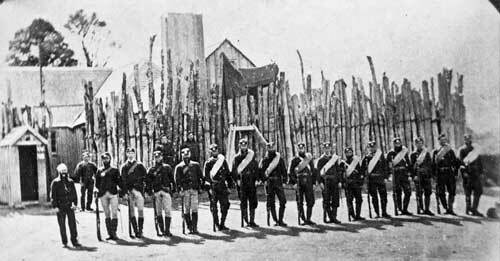 This shows the Armed Constabulary post there in the early 1870s. At first its troops did not enjoy this dangerous and isolated location, but by the late 1870s they were guiding parties of tourists around the area. The Ōpepe post remained open until 1885.